One of my all time favorites. Bill Murray gives what may be the best performance of his career in this unique comedy, arguably the best of the 1990’s. 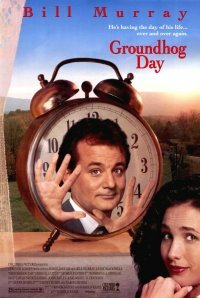 Murray plays Phil Connors, a cynical and grumpy weatherman who is dispatched with producer Rita (Andie MacDowell) and cameraman Larry (Chris Elliot) to a friendly town in Pennsylvania to witness the annual Groundhog Day Ceremony. It is clear to us that Phil doesn’t want to be there at all, and wishes he were just about anywhere else. When they get snowed in, Phil wakes up the next morning to discover he is reliving Groundhog Day all over again. He isn’t exactly thrilled, especially when he relives it again the next day, and the next, and the next. It’s a terrific concept that first causes Phil to deal with the situation in a funny and cruel way. He knows everything will be wiped clean, and he can start fresh the next day. He becomes an expert in medicine, ice sculpture, poetry, piano playing and a number of other things. He even asks a woman what she looks for in a man, and the following day embodies all those attributes to the lady. Later on he commits suicide in various ways, only to realise that he will wake up the next morning alive and well. Eventually, he tries to improve his behavior, aswell as his people skills, in order to impress Rita, who sees him only as the grumpy man he’s always been. In between, there are hilarious gags, and the movie keeps coming up with twists and turns, even when you know there’s nowhere else it can go. Watch it, then watch it again, and again, and again. Comedy is rarely this terrific. I loved the comedy in it. I was really waiting to see what is gonna happen at the end. Where we realise that it comes to teach us how to look at things in a good and optimistic way, without being arrogant to people, so the consequences will be better and we will enjoy life and every moment in it. hehe exactly. This isnt just a comedy. There’s a message hidden and i loved what it was trying to say. One of my favorite movies! It never gets old!